There are times when I feel myself teetering on the border of sanity. Fortunately I usually pull myself back before doing anything seriously regrettable. And just now I had one of those experiences. Today is yellow bin day, which, if you live in the City of Glen Eira, you would know means you have to leave out your yellow-lidded recycling bin, along with the general landfill rubbish bin, for collection. And more importantly you would know what items may and may not be placed in this recycling bin, and you would, of course, be careful to only place permitted items in it. Or so that is what I thought, until a few minutes ago. As I was walking out of my house this morning I noticed a large object poking out of my recycling bin which hadn’t been there when I put the bin out last night. This in itself was not an issue as it is perfectly acceptable to take advantage of space in a neighbour’s bin once it has been place outside the boundaries of their home. But it very soon became obvious to me that this large object was actually many small object inside a plastic bag. Convinced I must be mistaken I spent just slightly too long staring at the bag before I assured myself that yes, someone really had put a plastic bag in my recycling bin. Doesn’t everyone know that plastic bags are the absolute “no no“ of recycling bins? Plastic bags can jam the machines at the sorting centre, causing no end of havoc, and even if they get through these sorting machines they will then be discarded unopened due to health and safety concerns. Empty the contents of the bag into my recycling bin and throw the bag into the general waste (then wash my hands carefully). Lift the bag out of the recycling bin, with the aid of a nearby stick, and drop the whole thing into the general waste bin. Pretend I hadn’t seen the offending item and walk away. The yuk factor precluded option 1. No matter how strongly I advocate correct recycling practices, I also cannot bring myself to delve into someone else’s discarded waste. I also quickly excluded option 3. Seriously, the idea of the waste collectors thinking I don’t know how to recycle correctly was too humiliating. So I grabbed a stick, carefully lifted the bag and dropped it into my red general waste bin, silently bemoaning all the items that would forever languish in landfill rather than find a second life. I did, though, get a brief moment of serenity knowing that I wasn’t a recycling extremist and could accept defeat graciously when necessary. This moment ended abruptly when I noticed a similar bag protruding from the neighbour’s recycling bin and I was forced to weigh up another set of possible actions. The first being to knock on the neighbour’s door and explain politely why plastic bags were unsuitable for a kerbside recycling bin, but there was a chance that a third party may be responsible for both of these misplaced bags, and not the neighbor. It also might seem stran ge from the neighbour’s perspective that someone would knock on their door to lecture them on proper recycling practice, and I strongly value good relationships with those who live next door. I briefly considered tipping this bag into the general waste bin, as I had done with the one in my own recycling bin. But as tempting as this was, I realise that whilst rearranging the contents of one’s own bins might be just about socially acceptable, rearranging the contents of a neighbour’s bins would definitely be classed as weird. I therefore turned around and walked back into my house. Place your plastic bags for recycling in one of these bins at your local supermarket. The best plan of course is to reduce your plastic bag use altogether, by taking your own reusable bags when you go shopping. However, if you still find yourself with excess plastic bags at home, the good news is that you do not need to send them to landfill, as it is possible to recycle them at special facilities. 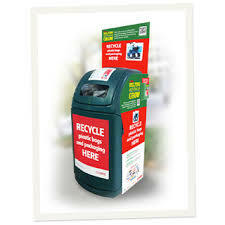 Coles and Woolworths, for example, accept plastic bags for recycling, which are then made into outdoor furniture, through a company call REDcycle. Just please, please don’t put them in your kerbside recycling bin. Previous Post Can we still love the pre-loved?